CROSBY — The Crosby Cougar 8A team defeated the North Shore Mustangs by the score of 11-10. Again, the Cougar defense turned in a great game by holding the Mustang offense out of the end zone. Gage Adams intercepted one pass and recovered one fumble, Jeremy Bets intercepted one pass on defense and also score the only touchdown on a 30 yard in the third quarter. Andrew Gwyn, Randy Rasmussen and Jered Boyette also turned in good defensive games. On offense, Jacob Schexnayder kicked a 23-yard field goal and kicked the extra point. Chris Corman, Jordan French and Matthew Rhineberger lead the blocking up front for the Cougars. The Cougar 8A team is now 2-2-2 on the season and 2-1 in district play. The Crosby Cougar 7A team defeated the North Shore Mustangs by the score of 16-13 for their first win of the season. The Mustangs scored on the first play of the game. Crosby answered two drives later with a 75-yard touchdown by Xavier Frank. Cody Wilson made the first of two extra points on the day. The Cougars had the lead a halftime by a score of 8-6. The Mustangs scored with 3 minutes left in the game to put the Cougars down 13-8, but the Cougars never say die attitude shone through, and Frank scored his second touchdown. The entire defense played a spectacular game. Tristan Arceneaux and the rest of the O-line did a great job of blocking for the backs. The Crosby Cougar 8B team was defeated by the North Shore Mustangs by the score of 21-0. Having good games on defense were Nicholas Collins, Julius Jordan, and Donnie Greer. Good performances on offense were turned in by Ryan Nutt, Chance Meadows and Cade Ramirez. The Crosby Cougar 7B team corralled the Mustangs of North Shore in a 41 to 14. Farron Marion led the charge, scoring 5 touchdowns and one extra point. Stephon Gilbert scored one touchdown helping the Cougars over the top. Braelon Green scored 3 extra points, and Ray Stutts ran in one. The offensive line did a great job protecting the running backs. Defensively, Jared Oliver and Andre Mitchell were everywhere. The defensive line denied the Mustangs running room and made the Mustangs pay for every yard gained. 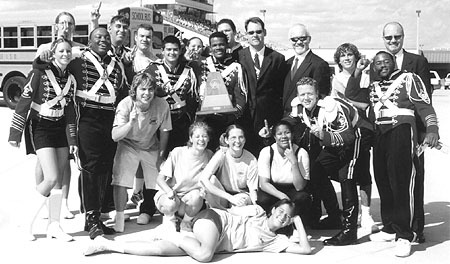 GALENA PARK — On Saturday, October 16, 2004, the Crosby High School Military Marching Band competed in the Region XIX UIL Marching Band contest at Glena Park ISD stadium. The Crosby High School Band was the only 4A band to earn a division one rating, the highest rating possible. The bands sound was great and the marching drill was outstanding. The Crosby Band is under the direction of our new directors Adam Bird, Head Director and Jim Doiron, Assistant Director. This being a transition year, Mr. Bird, Mr. Doiron, and the band worked hard all semester and have overcome many obstacles to achieve success. Congratulations! The campaigning and the commercials are just about over – and Election Day is upon us. As a citizen, you have something at stake in this election, and in every election. But as an investor, should you really be that concerned over who wins the presidency? You might think so, if you listen to all the claims coming from both parties. And yet, many of these charges and counter-charges are just rhetoric. Here’s the bottom line: Individual investors have done well and poorly under both Democrats and Republicans. Ultimately, the good health of the financial markets – and, by extension, your investment success – depends on a variety of factors having relatively little to do with who’s in the White House. Does a presidential election have any impact on the markets? Yes. If an incumbent wins, the stock market typically has performed a little better over the next year – but that’s often because the markets don’t like the uncertainty caused by change. And this positive effect is really a short-term reaction. Over the longer term, a particular administration’s policies can have some effect on the economy, which in turn affects the markets. But it’s far from clear just how much control any president has over economic forces. And not infrequently, an administration’s actions may not even have the desired economic results. *Corporate profits – As a determinant of stock prices, corporate profits matter greatly – today, tomorrow, next year and next decade. Corporate profits are a key driver of the financial markets. If you want a fairly dramatic illustration of this point, you need only look back a few years, to the late 1990s, when “dot-com” stocks were all the rage. Investors couldn’t get enough of these companies, which seemed fantastically full of potential. However, potential is not profitability – which is something many of these companies lacked. And in 2000, this problem caught up with these stocks: Their prices plunged, and the fall helped drag down the entire market. *Sustainable economic growth – If you want to see what might lie ahead for the financial markets, you might want to watch the progress of our economy. In general, a sluggish economy is not particularly good news for investors, particularly those who invest in stocks. At the other end of the spectrum, an economy that’s too hot can lead to inflationary pressures and movements by the Federal Reserve to raise interest rates – events that may also bring mixed results to investors. Consequently, you and other investors might want to hope for a “Goldilocks” economy – not too hot, not too cold, but just right. If you want to have a voice in how your government is run, you need to vote – it’s that simple. The winner of the presidential election can play a huge role in shaping the issues of the day. But, as we’ve seen, other factors are likely going to be more responsible for determining the investment outlook for the next four years. So, when you enter the voting booth, let your conscience – not your brokerage statement – be your guide. CROSBY — The Crosby Cougar White team improved their record to 4-2-1 by soundly defeating the Galena Park Yellowjackets last night 26-6. After allowing an early touchdown drive, the defense dominated the remainder of the game led by Hernand Hernandez, Alan Sailors, and Qualan Bolds. Khani Lee quarterbacked the offense to score 4 touchdowns on 5 possessions. Lee scored on a 30 yard scamper up the middle and also connected on a 56 yard TD pass to Tyler Malchar who used his blazing speed to outrun the defense of GP. Keidran Gregory scored on a great 40 yard run eluding many defenders, and Jarriel White capped off the scoring with another touchdown run. The Cougars continue to get better every week so come out and support your team as they face Hull-Daisetta here at Cougar stadium next week. Congradulations to the Crosby High School Freshman Red Team as they defeated the Yellowjackets of Galena Park 19-6. Offensively the Cougars were led by quarterback Durran Starks hooking up with Rusty Jones for two touchdowns on the night. Kevin Humphries led the team in rushing with one touchdown. Tyler Joseph was 1 for 2 on the night kicking the extra point. Defensivley the Cougars were led by interceptions by Zeph George, Brandon Jacobs and Rusty Jones. Jones and Bubba Bryan also recovered fumbles for the Cougars. The win brings the Cougars record to 4-3 on the season and a 2-0 district record. The Cougars host Smiley next Thursday at Cougar Stadium. Lets now take a look at what the NFL has to offer .